Convene 2.9 Launches All Kinds of Goodies! 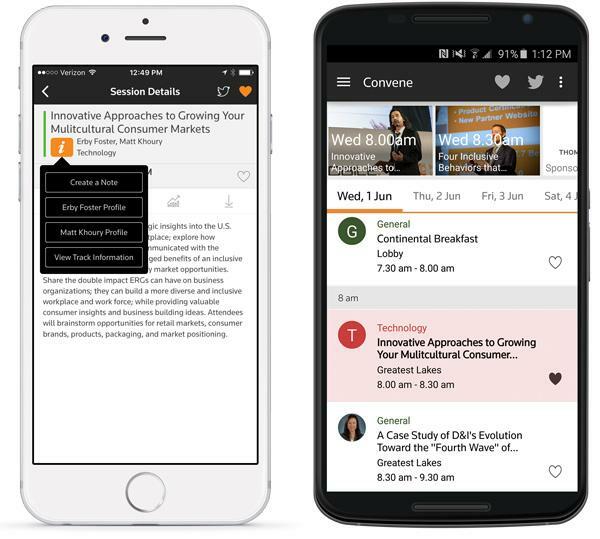 Convene 2.9 for iOS and Android is here! We've introduced a slew of exciting features to our mobile apps, and they're all available right now! Notes: Now you can take notes in Convene and share them with other applications like, Evernote, DayOne, One Note, Mail and more. Favorites Animation: We'll draw your attention to the favorites menu, where all of your favorite sessions are listed. Attendee Search: Looking for an attendee? Now you can search for a person based on a variety of attributes. Contact a Sponsor: Want to exchange information with a Sponsor? Miss an opportunity to connect? Email Sponsors directly. Contextual Highlights: Items in the event schedule are now contextual, so, if there's a VIP session on day 3 and today is day 3 of the event, we'll default you right to that point in the highlights carousel. Continuing Sessions: Sometimes we lose track of sessions or activities that span hours, like Registration or Talk to the Expert. We enhanced the event schedule so you'll never miss a thing. New Event Indicator: Many events repeat annually and sometimes people attend more than one Convene event. We'll let you know when a new event is available for you, and alert you in app! Event Schedule enhancements: We've enhanced the event schedule by making it easier to identify the track that a session belongs to by adding "track circles." Want more info about the track? Just tap! In some cases where a track isn't available, we'll show the speaker's photo, right in there in the schedule to give it a personalized touch. Richer Speaker Profiles: Sometimes speaker's want to share more info than title, company, and bio. Now they can! Speaker's can share their: email address, Twitter handle, website, LinkedIn URL. And, even more coming soon! We're always working to improve usability & performance with every release. Both apps are faster and even more reliable. We've also improved the usability of certain features by adding subtle animations to draw your attention to areas in the app you might be interested in using more. Finally, we love feedback! Have an idea for us? We'd love to hear from you!